Everest Base Camp trekking is not only the trek to the foot of the world's tallest mountain i.e. Mt. Everest, but also an adventerous trek that allows you to explore the Everest region. While Trekking in Everest, safety of our clients is our main concern and "adventure with safety" is what we prefer. We are proud to say that all of our guides are licensed, well experienced in mountain conditions and possess good knowledge about the safety as well. Trekking with highly experienced crew members with proper support and safety back up assures you to have great holiday that you will cherish throughout your life. We make sure to have comprehensive first aid kits on each trip. Hiking on the legendary foothills just below the mighty Everest with breathtaking views of the master peaks can only be found in the Everest Region. On this Everest Base Camp trek you will also peak out at the famous Kala Patthar (5,545m) and Everest Base Camp (5,350 m) with magnificent views of Makalu, Cho-oyu Mt Lhotse and many other peaks. Everest Base Camp trekking begins the day after you land at the Tribhuwan International Airport in medieval and modernized Kathmandu. The trail begins after a thrilling flight to Lukla where we meet our supporting crews and heads up the Dudh Koshi Valley. We then set for the mountain junction town of Namche, crossing the rivers on high suspension bridges. We enter Sagarmatha National Park and the track then follows through the pine forests and we reach Monjo after crossing the prayer flags festooned bridge over Dudh Koshi river and reach Tengboche. Descending through a forest we reach Imja khola from where we again climb uphill to reach Dingboche. Everest Base Camp Trekking continues up the wide valley beneath the impressive peaks of Cholatse and Tawache on the left. We head to the foot of Khumbu Glacier from where we climb gently along the glacier, to eventually reach the cluster of houses at Lobuche. The path climbs through meadows and moraine stones to reach Gorakchep, by either climbing to Kalapatthar or continue heading to Everest Base Camp. After witnessing the superb close range views of towering mountains we descend to Pheriche. We retrace our steps with a trek back to Namche from where we hike to Lukla to fly back to Kathmandu. Day 02: Mountain Flight to Lukla [2,810 m], Trek to Phakdaing [2,640 m]. Day 03: Trek to Namche Bazaar [3,440 m]. Day 04: Rest day at Namche [3,440 m] side trip to Everest view point. Day 05: Trek to Tyangboche [3,860 m]. Day 06: Trek to Dingboche [4,350 m]. Day 07: Trek to Lobuche [4,930 m]. Day 08: Trek to Gorakchep [5,170 m] Everest Base camp [5,350 m] in the afternoon. Day 09: Trek to Kalapattar [5,545 m] and back to Pheriche [4,250 m]. Day 10: Trek to Namche Bazaar [3,440 m]. Day 11: Trek to Lukla [2,810 m]. Day 12: Fly Back to Kathmandu [1,338m]. Day 14: Trip ends! Fly back home, taking with you the memory of a life time. Day 01: Arrival to Kathmandu (1,330m): A representative from Adventure Treks Nepal will be outside the Tribhuwan Internation Airport according to your arrival time. You will be transferred to hotel where we will have a small briefing session about the trip once you have settled in. Please do let us know if you have any question regarding the trek and if you want to do anything different from the planned program. We can help you with all your queries. Day 02: Flight to Lukla (2,652m), Trek to Phakding - (B/L/D): Early in the morning we take a picturesque 45 min flight to Lukla from where we begin our journey into the Himalayas. Once we meet our supporting crew members (Porters) we descend towards the furious Dudh Koshi River that originates from the glacier of highest mountains. We gradually trek along the potato and wheat fields and reach the village of Phakding for our first overnight stay in the mountains. Average trekking time is 3 hours. Day 03: Trek to Namche Bazzar (3,440m) - (B/L/D): After your breakfast we head to the famous Namche Bazzar walking through the dense Rhododendron and Pine forests and along the terraced fields. We finally enter the Sagarmatha National Park crossing the Dudh Koshi River twice on this day. We will see many yaks throughout the trail to Namchhe carrying goods to be transported in different parts of Everest Region. We will always have Nupla (5,885m), Kongde Ri (6,093m) and Thamserku (6,808m) in the background rising majestically throughout the day. Overnight stay in Namche Bazzar. Average trekking time is 5 to 6 hours. Day 04: Acclimatization day, day hike to Shyangboche (3,833m) - (B/L/D): This is a rest day in Namche Bazzar for acclimatization. Due to the thinning air it is important to spend an extra day in Namchhe Bazzar to become familiar with the climatic condition. During the day you can hike up to the Everest View Hotel in Shyangboche for mesmarizing views of Ama Dablam and Mount Everest. Average trekking time is 2 hours. Day 05: Trek to Thyangboche (3,780m) - (B/L/D): In the beginning of the day we trek over the ridge that offers splendid views of Ama Dablam. Everest can be clearly seen on the horizon before we enter the Rhododendron forest and descend on a smooth track. We will cross the raging Dudh Koshi River once again and continue our trek to the famous monastery in Thyanboche which is considered a spiritual and culture center of these highlands. The monastery was first built in 1912 but later it was destroyed by fire in 1989. It has been recently re-built with the assistance of Sir Edmund Hillary. There is high possibility of seeing wild animals like Musk Deer, wild Goat and Pheasants in the forest during the trek on this day as this area is a devout Buddhist region. Overnight stay in Thyangboche. Average trekking time is 4 to 5 hours. Day 06: Trek to Dingboche (4,365m) - (B/L/D): To begin the day we climb uphill to Imja Khola which then is followed by a easy walk along a wideopen path to a tiny sherpa settlement called Pangboche (3,901m). You will meet many Sherpas who have successfully summitted the Mount Everest and the number is more than the rest of the world combined. We will also visit a ancient monastery where Lama Geishi gives his blessing to ones who attempt to climb the world's tallest mountain. The trek goes on a uphill path through the valley with stunning mountains all around. Overnight stay in Dingboche. Average trekking time is 4 to 5 hours. Day 07: Trek to Lobuche at (4,955m) - (B/L/D): After your breakfast we start our day with walking on a drier landscape above the treeline with wonderful mountain views of Cholatse, Lobuche and Pumori infront of us. Many Rock Cairns can be seen while passing from Dugla Ridge which are dedicated to the departed soul of those who died attempting to conquer the Everest. We then move in the direction of Khumbu Glacier which is also the longest in Nepal. The night in Lobuche will be comparatively cold as we will be more elevated and exposed to the upper slopes of the valley. Average trekking time is 4 to 5 hours. Day 08: Trek to Gorak Shep (5,395m) - (B/L/D): The initial trail of the day is a rocky moraine of the Khumbu glacier heading high towards the settlement of Gorak Shep. 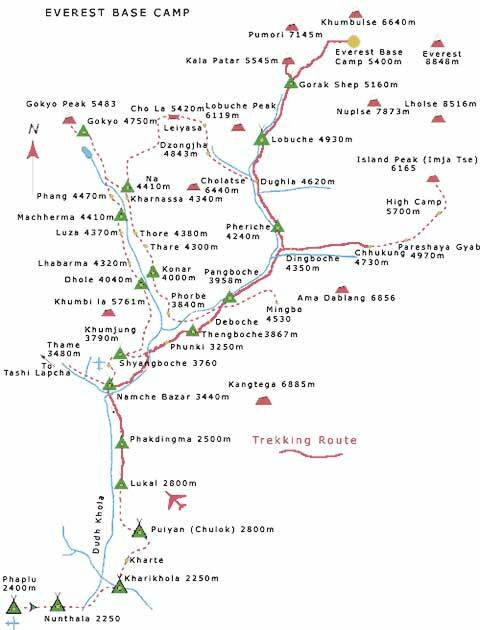 We will stop in Gorakshep for Lunch and proceed to the Everest Base Camp for the 360-degree himalayas views that includes some of the famous mountains like Everest (8,848m), Nuptse (7,745m), Lhotse (8,516m). Overnight stay in Gorak Shep. Average trekking time is 7 to 8 Hours. Day 09: Climb Kalapattar, Trek to Pheriche (4,252m) - (B/L/D): On this day we trek upto the famous Everest view point of Kalapattar at an elevation of 5,545m above the sea level. If the weather is in our favour we will be seeing extraordinary view of the black pyramid that is Mount Everest. The view from Kalapattar is beyond the explanation and the Everest almost looks unclimable. After spending some time in Kala Pattar we trek down to Pheriche for overnight stay. Average trekking time is 8 hours. Day 10: Trek to Namche Bazaar (3,440m) - (B/L/D): After successfully trekking upto the Everest Base Camp we unwaveringly descend down to Namchhe Bazzar. We walk through the villages of Orsho, Shomare, Pangboche and Devoche. We will take a short break in Pangboche visiting the famous Pangboche monastery, the oldest in the region. The view throughout the day is pleasing. Average trekking time is 7 to 8 hours. Day 11: Trek to Lukla (2,652m) - (B/L/D): We return back to Lukla as we retrace our footsteps along the Dudh Koshi River. The beautiful and smooth path through rhododendron and pine forests reaches to Lukla after climbing out of the river valley. We spend our last night in mountains. Average trekking time is 6 hours. Day 12: Fly Back to Kathmandu - (B): We get on a flight back to Kathmandu after we say final goodbye to our supporting crew members. Upon your arrival in Kathmandu, you will be transferred to the hotel. The rest of the day is at leisure. This day also acts as a buffer day incase of flight cancellation to or from Lukla due to weather condition. Day 13: Free day in Kathmandu (1,330m) - (B): There are many historical places to visit in Kathmandu Valley which are listed in UNESCO world heritage site such as ancient palaces of Kathmandu, Bhaktapur and Patan, Pashupatinath Temple, Swayambhunath, Bouddhanath, etc. You can spend time around the streets in Thamel shopping or chill in a restaurant. We are always ready to offer you some recommendations. Day 14: Fly back home (1,330m) - (B): You will be dropped to the Tribhuwan International Airport by a representative from Adventure Treks Nepal according to your flight time. Fly back home with lots of beautiful memories. Accomodation in Kathmandu with breakfast. Breakfast Lunch and Dinner during the Trekking. Accommodation in Tea house (mountain lodge) while trekking. Kathmandu - Lukla - Kathmandu by flight. Trekking Porter with insurance. (We provide 01 Porter for 02 Pax). Drinks, Dessert, Juice, Water, Heater charge, Hot Shower during the Trekking and main meals in cities. Tips for the Guide/Porters and Drivers. We offer trekking in Nepal from mid-September to May. However within this period there are clear seasons in the weather. From early September the monsoon rains decrease. By mid-October through to December the weather is usually stable with mild to warm days, cold nights and clear views. Daytime temperatures can reach 25-30 deg C at low altitude in October and nights can drop to below 0 deg C at higher altitudes. The monsoon creates a rainy season in Nepal, which lasts from mid-June to mid-September. During this time the Nepal Himalaya is unsuitable for trekking, with the exception of a few remote valleys. We offer treks during this period in Low altitude Treks in the Nepal Himalaya, Tibet & India (Kulu, Ladakh). The pre-monsoon period:In March the cold, dry winter season begins to give way to warmer, wetter spring conditions. Mornings are usually clear with cloud build-up bringing occasional afternoon rainstorms. Views of the mountains in the middle of the day and afternoon may often be obscured. Daytime temperatures increase quickly in March with temperatures of up to 30 degrees Celsius and mild nights. At higher altitudes it is similar to the conditions of the post-monsoon period, however there is usually more snow, which has accumulated over the winter period. There are spectacular displays of rhododendrons and wildflowers at this time of year. Late spring conditions ie April and May, are generally hot at low elevations and as the clouds build up to the next monsoon, daily afternoon rainstorms are common. OVERCOMING ALTITUDE PROBLEM: This is often known as Acute Mountain Sickness (AMS), which is particularly a matter of important medical consideration while trekking in the Himalayas. Altitude Sickness means the effect of altitude on those who ascend too rapidly to elevations above 3000 meters. Early mountain sickness will manifest itself in headache, nausea, shortness of breath, fatigue; etc can be encountered as initials of the sickness. The major information source on prevention and treatment of the sickness is Himalayan Rescue Association (HRA) and Adventure Treks Nepal (P). Ltd. is the confide life member of it. We assure every trekker that all our guides have followed the training conducted by HRA with the understated information.